Everyone needs a good alarm clock. If you are like other people, you might use your Android device as an alarm clock, but really, shouldn’t you have something a bit more proper? 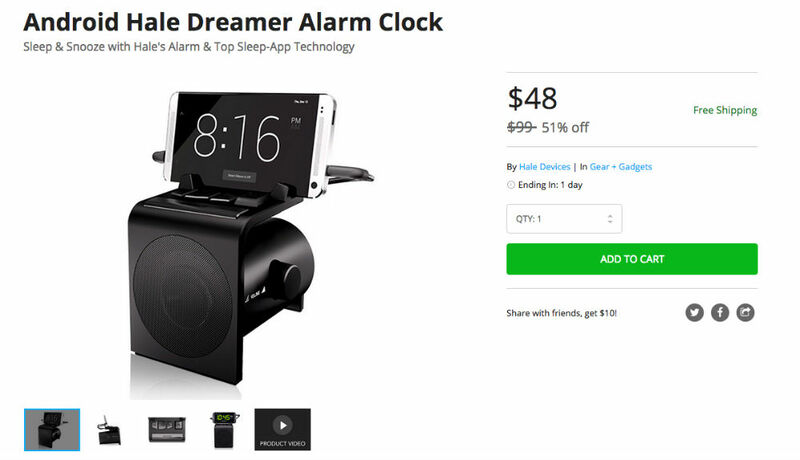 On the DL Deals Store, you can pick up a Android Hale Dreamer Alarm Clock for $48, down from its usual price of $100, perfect for turning your basic Android smartphone into a beasty alarm clock at night. The device is simply an attachment for your phone, but is a nice looking alarm of sorts. It features a 2.25″ mono 10-watt speaker, capable of waking even the soundest of sleepers. The Hale Dreamer features a few special touches for when your device is hooked up. For example, if someone calls you, the machine will auto reply with an SMS saying, “call back later,” or another phrase. You can also utilize it as a speakerphone for taking calls. If you need to step up your alarm clock Android game, check it out.